As the house slowly becomes more and more over run with hair clips, bows and more hair accessories I am finding them everywhere. I even pulled a hand full out of my bag during a meeting. When I had the opportunity to review the Hair Helper in return for the product I jumped at the chance. It’s our first review on Shes a Working Mum! It arrived by first class post well wrapped in a box which was nice as it was safely packaged. I liked the logo printed on the box it’s a neat little touch! I took out address off the front so excuse the messy middle! 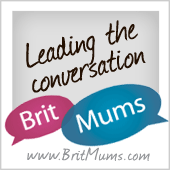 The company is an independent brand set up by a mum (hi Vanessa!) who had a baby with lots of hair. They are cute pictures on their website and their story. What started as a crafting project using Pinterest became a business venture and success. The business has even won and been nominated for awards like the Women in Business award and Best baby and Toddler Gear award. It’s such a great idea it’s quite surprising there are not more of these products about. When you are ordering you choose the colour of your frame (pink or white) and then you pick three ribbon colours. You can choose extra ribbons if you want to change the colours in the future. I thought this was a good idea if you decorate. We have purple green and blue. It comes with a brush holder that you screw in yourself and some brackets so it can be hung on the wall. There is a helpful YouTube video to show you how to assemble it. I hadn’t actually realised it was a brush holder until I saw someone share theirs – genius – unlike moi! We also had letters included in ours so we can add Marnie’s name. I have not added them yet because I am considering doing a bit more customisation to it. I have decoupatched some other bits in her room and so I am thinking of doing the same. In all honesty it probably won’t happen as life’s to busy but a good idea don’t you think? It’s going to hang on the back of the door so that when she’s a bit older she can (hopefully) look after her clips herself. This I recognise it’s a big dream but start them young……. If you want to buy your own Hair Helper ( which after trying it my self I would recommend you do!) you find them on their website The Hair Helper and you can find them on Instagram. They cost from £17.99 and you can pay extra for some of the decorations and ribbons. I was not paid for this review. I was sent the product by The Hair Helper in return for a honest review and all thoughts and words are my own. What a simple but great idea! I love that you can hang it on the door as well. You guys have so many bows! If only my girl had more hair then we can buy some!!! Fab giveaway! What a great idea- my wee boy wouldn’t have much use for it but I’m sick of constantly losing Kirby grips and bobbles!